Let’s start off with the easiest. GTI, probably the most famous letters in the world of hot hatches. It started off as the performance variant of the original Golf back in 1975. And since than with every new generation of Golf, a GTI version is guaranteed. After a while other different GTI models started appearing, such as GTI versions of the Polo, the up! 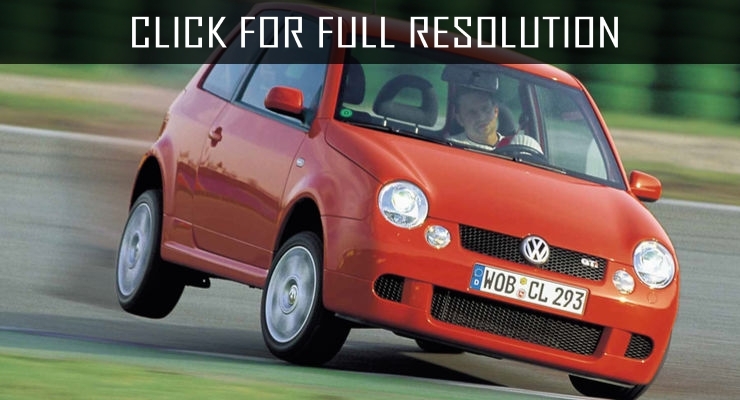 the Lupo....wait there was a Lupo GTI? A Gol GTI? Oh these look so cool, how come I’ve never heard of them before?! Even now with a range of 3, it’s still kinda hard for my head to wrap round that there are GTis other than the Golf. There was also a period where Volkswagen used the VR6 designation for any performance models using (you guessed it) their VR6 engine, which was more powerful than it’s GTI contemporaries. For the Mk4 Golf, the VR6 model was basically renamed R32, and also gained an AWD drivetrain from the Audi TT. And when they ditched the V6 for the Mk6, the name changed again to the Golf R. So every time there was a major change to the formula, the name changed with it. The R badge basically means more powerful than the GTI and has AWD. You see, like every mainstream car manufacture, VW has a faux-performance line, with the sporty looks but minimal to zero actual performance improvements. VW’s is called R-Line, which serves as the highest trim level and is obviously meant to evoke their actual R cars car. Although, once again, isn’t the entire point of R cars, is that they’re AWD and have more power? And R-Line models tend to have none of those properties compared to their regular counterparts. I know that these things are meant to be cash grabs and all, but I don’t see any semblance to the proper R models. Interestingly they didn’t try to cash in on the GTI name. I think the old GT trim makes alot more sense than the R-Line, in which they evoke the GTI but they’re clearly not actually a GTI. You can see the link between it and the real thing, unlike the R and R-Line models. For the Mk5, there was also a GT Sport trim, which I don’t think there was any performance differences from the regular GT, just extra kit. In fact there was also a Sport trim, which was actually just the name for one of the lower trims. Guess VW always had problems with this naming stuff. I think this is a picture of the GT trim, but I actually have no idea. Unfortunately since than, the GT name has basically become the name of the second highest trim level, with basically no resemblance to anything sporty. But it’s not all gloom, as the Passat GT actually sticks to the original idea of the GT trim. The only discernible difference to the regular Passats however is tweaked suspension. Hey, maybe we should make a performance version of the Jetta? Sure. Hey we’ve got some GTI parts lying around, let’s use those! Let’s swap it with a GTI engine! Don’t forget some GTI suspension parts! Whoo! What a pocket rocket! What shall we call it? Hmm, there’s no way it deserves the GTI nameplate, they’re like 2 completely different vehicles! We need a different name. Hmm....I’ve got an idea! Who said companies couldn’t make their own in-house knockoffs? Seriously what was the logic behind this? Is there some unwritten rule that GTIs can only be hatchbacks? From what I’ve read, at least with the modern ones, that they use the same engines, but the GLI tends to have less torque, a bit less refined and....that’s really it? 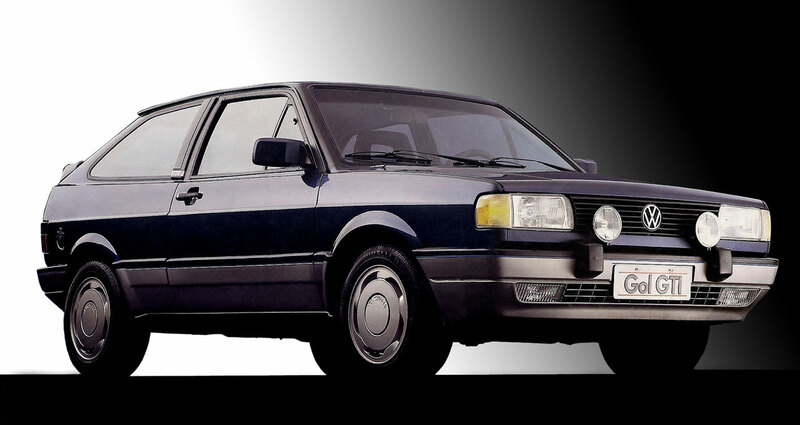 I mean, if you called it the Jetta GTI, would anyone really be angry? You wouldn’t even have to change the styling, it looks like a GTI as it is (That’s starting to become a theme here...). Up the torque and fettle the chassis a bit than if that’s really what’s preventing it from earning that badge. In fact, calling it a GTI could get people to start to notice it more. So if you wanted to see what a VW GTI ute looks like, here it is! This is the Brazilian exclusive Pepper trim for the up!, Fox, and the sweet little Saveiro ute. Basically GTI-lites, the up! Pepper here produces 105hp (in comparison, the regular produces 59-73hp, while the proper GTI gives out 113hp). Also they all come with a stick shift as their only option. Nice. There was also the Beetle Turbo, which shared the same 2 litre as the Golf GTI-Ah! Again! Same engine, different badge. And yes, I know this is hearkening back to the original Beetle Turbo, which is probably a better fit than Beetle GTI. Oh well, like the Scirocco it’s dead too, so I can’t mope about the name too much. To bridge the gap between the regular and R versions, a Scirocco with the GTI engine was introduced, called the GTS...... VW WTF! You had 3 different models with GTI engines and GTI styling and you give them all 3 different names each! Why isn’t this called this the Scirocco GTI? It wouldn’t be the first! Or if you didn’t want to risk diluting the GTI brand, than use the GLI badge instead! Consistency man! Turns out VW’s going to stick with the GTS name as their official counterfeit GTI, with the release of the Chinese exclusive Lamando GTS, which once again, shares the GTI engine. Once again, how is this approach any different from the GLI? In fact, just a a couple days ago as of time of writing, VW presented 2 concepts of a Polo GTS and Virtus (Polo saloon) GTS, intended for South America. Apparently the GTS name has a little bit of history there, with a Brazilian exclusive Passat GTS. These concepts have a newly developed 1.5 litre TSI engine that’s available in the Golf, in contrast to the GTI’s 2 litre and-Wait a minute! I thought the GTS name basically meant a GTI model without the expectations of being a GTI! And now they’re positioning it as a sub-GTI? Even more confusing, is that in the Philippines, GTS was the name for the Golf estate! VW make up your mind what GTS stands for! Than there’s the GTE range. Now I always thought that these were the performance versions of their electric models, the e-Golf GTI if you will. But nope, turns out that’s just the brand for their plug-in models, slight GTI-esque styling is the only thing they really tried to make sporty. Finally there’s the Golf GTD, basically the diesel counterpart to the GTI. Personally I think they should’ve been a GTI, and maybe a little TDI badge in the corner. With the different name of GTD it kinda brags to the world how your car is a diesel, not unlike electric cars, where they almost always have an e in their name. And who on earth brags about how they got the diesel version. I guess VW is that person, who must be so proud of their diesels, that they just have to advertise it so prominently on their model. Yeah! That’s it! So that’s a not-at-all confusing look at the 236 different ways you can get a fast Volkswagen. In fact, there was a few more I didn’t list, mostly limited production, special editions or concepts (such as RSi, used only for an über-limited New Beetle with a VR6) but I hope that I got all of the major modern ones. Who knows? Seriously, writing this took forever as I kept finding new performance trims to write about! I’ll probably discover 27 more examples after I post this! See, look at the left most Golf. VW considers the GTE as a performance car, when it’s clearly not! Now come on VW. I hear you’re trying to enter a new era for yourself after some small slip ups (something about diesels? ), and that means the chance to simplify your entire performance lineup! Here’s my suggestions. GT-Line: Replaces the R-Line. Gains very mild GTI-like styling, and mild or zero performance enhancements. GT: Serves as warmer versions of the full-fat GTIs. Gains GTI-like styling. 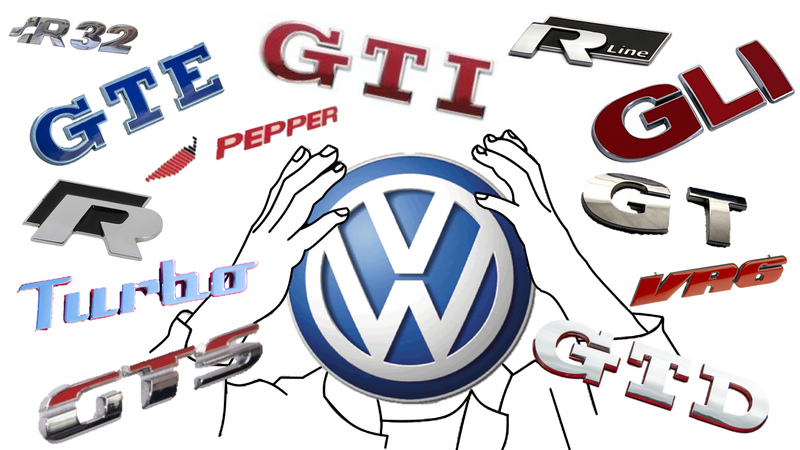 Rename the Pepper line as GTs if they’ll continue to be a thing, and up the power on the Passat GT. If the Polo and Virtus GTS ever make production, call them GTs as well. GTI: Keep how it is. Develop proper GTI versions of the Jetta and Lamando to replace the GLI and GTS versions (in which those nameplates would be killed). R: Keep mostly how it is, but make AWD a requirement. Doesn’t have AWD, but is more powerful than a GTI? Call it a GTI TCR or something. Rename GTE to something like “Golf plug-in hybrid”. Or make them actual performance versions of the electric models (although, considering every performance sub-brand will inevitably go electric, maybe not). Bring back the Scirocco and introduce a new rear engine RWD Beetle. Make GTI and R versions. If there’s some super glaringly obvious things I’m missing, like the reason why a Jetta GLI can’t be called a GTI or if there is some tangible difference between GLI and GTS, please inform me by telling me that making this post was a complete waste of time.